Find the number, weight and size of bags that are included in each type of Air New Zealand fare and easy ways to pay for more. Get baggage allowance information for connecting flights and journeys with more than one airline. When you book directly with Air New Zealand, your baggage allowance is on your e-ticket. If your trip includes flights with other airlines, our baggage allowance might not apply. To learn more, see more in connecting flights below. Aside from seat-only fares where you get carry-on only, all our fares include checked-in baggage. Need more? You can add Prepaid Extra Bags and bring your checked baggage allowance up to a maximum total of three. seat+bag, flexitime and Smart Saver fares include one checked-in bag; flexidate fares include two. seat+bag, theworks2 and Economy3 fares include one checked-in bag, worksdeluxe and Premium Economy fares include two, and Business Premier™ and Business fares include three and cannot add more. 1 Airpoints™ Gold, Elite, and Star Alliance Gold members can add an extra bag for no charge to the standard allowance for their fare (not a family member's fare), where the ticketed itinerary has two or more Star Alliance airlines, except for seat fares. 2 For The Works fares to Honolulu, the baggage allowance is two checked bags. 3 For Economy fares to Shanghai, Singapore and Taipei, the baggage allowance is two checked bags. Effective from 19 September 2018, for Economy fares departing Australia to the USA (excluding Honolulu), South America, and Canada, the baggage allowance is two checked bags. If travelling with more than one carrier, please refer to the section when travelling on a ticket with more than one carrier. If you're connecting as part of a international journey, your international checked-in baggage allowance also applies for the domestic flight. Members get a free extra bag on top of the standard allowance for their own fare (not a family member's fare), except for Business and Seat fares. See Koru benefits for more details. Fast Bag is an extra benefit for Elite, Gold and Koru members, who can simply drop off and pick up their bag right beside the aircraft, on Air New Zealand regional domestic flights. Each checked-in bag can weigh up to 23kg (50lb) before incurring fees. Need more? Pay an excess baggage charge at the airport and get up to 32kg (70lb) if there's space on the aircraft. If your bag weighs more than that, you'll need to look at our information on unaccompanied baggage. The cheapest and surest option is to buy a Prepaid Extra Bag before your flight and repack. Got more bags than you’re allowed? It's easy to add a bag after you've booked, and you have a few options. First, if you're on a seat only fare you simply need to change your booking to a seat+bag fare. Retrieve your booking to do this now. If you've already got checked bags in your allowance but need more, you can buy a Prepaid Extra Bag online by retrieving your booking. They can be added up to 90 minutes before an international flight, or up to 30 minutes before domestic. Each passenger can have a maximum of 3 checked bags total. It's usually much cheaper to buy a prepaid bag than pay the excess baggage fees at the airport. If you wait too late, or your bag is overweight, see more about excess baggage fees. Got more than 32kg (70lb)? You'll want to look at our information on unaccompanied baggage. Taking sporting equipment or otherwise heavy or odd sized items? See more on overweight and oversized baggage. Each checked-in bag can weigh up to 23kg (50lb) before they incur fees. If your bag weighs more, you have a few options. Pay excess charges at the airport for bags up to 32kg (70lb). Got more than 32kg (70lb)? You'll need to look at our info on unaccompanied baggage. If another airline is a part of your journey and they have a different allowance, we cover that in connecting flights below. The size of a bag is calculated by measuring its length, width and height, and adding them together. 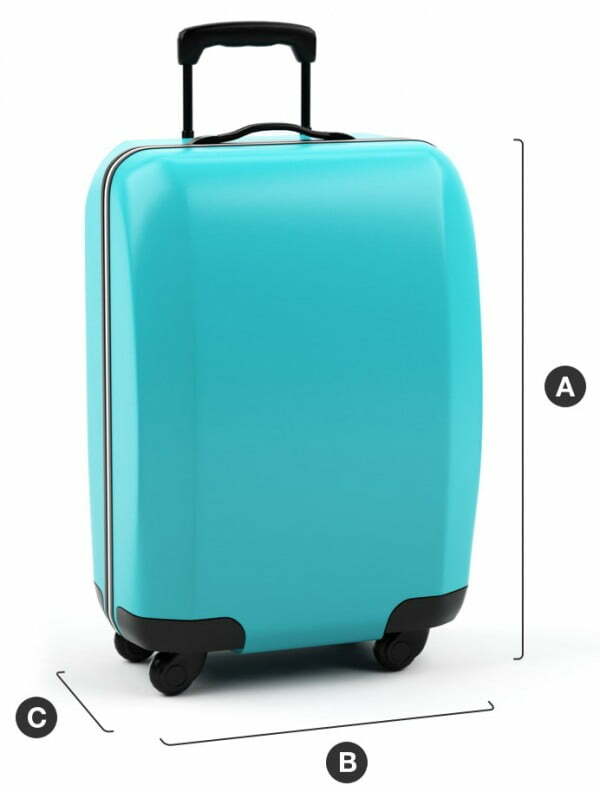 The total can be up to 158cm (62 inches) for each checked-in bag. If your bag is bigger than this, you can often pay an oversize charge at the airport and check it in if there's space on the aircraft. See overweight, oversized and sporting items for more. Your other option is to have two bags that fit these dimensions, buy a Prepaid Extra Bag before your flight, and repack. With the increasing innovation of "smart baggage" – baggage that includes technology, we're also seeing more hazards like lithium batteries, motors, power banks, GPS, GSM, Bluetooth, RFID or Wi-Fi technology that can pose a threat to aircraft safety if not handled correctly. Smart baggage can be checked in provided non-removable batteries contain no more than 0.3 g lithium or for lithium-ion does not exceed 2.7 Wh. Removable batteries must be removed if baggage is to be checked in and the batteries carried in the cabin. Smart baggage powered by lithium batteries can be brought as carry-on if it complies with our carry-on size and weight limitations. See travelling with lithium batteries, and remember to check with any other airlines if they're a part of your trip as well. Due to overhead storage limitations, bluesmart baggage can't be accommodated in the cabin of Air New Zealand Regional (turbo-prop) aircraft. Most sporting equipment counts as a checked-in bag and the usual weight allowance applies. Make sure your checked baggage allowance includes enough for your sporting gear and personal bags. If you need more, the cheapest option is to buy a Prepaid Extra Bag before you fly. To find out more, like length allowances and packing requirements, see overweight, oversized and sporting items. Our child fares include the same baggage allowance as adult fares for each fare type. Infant fares don't come with checked-in baggage, but do include one piece of carry-on. Read more about flying with children. Aside from animals transported for profit, like race dogs, you can bring domestic pets (cats, dogs and small caged birds) as checked in baggage on our domestic services in New Zealand. See more information and guidelines on travelling with pets. For safety reasons, some items are restricted or prohibited under international aviation laws. To learn more see prohibited and restricted items. Any item for carriage if it is insufficiently packaged to withstand the usual circumstances and effects of air travel. If you have an Air New Zealand flight that connects with another Air New Zealand flight or an airline we have an agreement with, your baggage will be tagged to go through to your final destination. However, some countries, like the United States, still require you to pick up your bags, go through customs, and re-check them at a transfer or check-in desk. Aside from America where it's always mandatory, the only way to know for sure is to ask at the counter when you check-in at the airport. If your connecting journeys are separately ticketed, you will indeed need to check in separately for each one, collect your bags and re-check them in between. The baggage allowance for the next part of your journey will then apply, so it's good to be aware of this before you pack your bags. If you're connecting from another airline on separate tickets, please contact the other airline to find out if your baggage can be checked through to our flight. Carrier is another word for airline. The operating carrier is the airline that's operating the flight. The marketing carrier is the airline that you purchased the flight with, and whose flight number is on the ticket. For codeshare flights, the marketing carrier may not be the operating carrier. If you've already booked your flights directly with us, your e-ticket will show your checked baggage allowance and which carrier's allowances and charges apply. If your journey includes more than one ticket, the baggage rules for each ticket will apply separately and they might be different. In this case, consider packing to the lowest allowance to avoid excess baggage charges. If you're travelling on a single ticket that includes more than one carrier, the allowance rules and any excess baggage charges of the most significant carrier (MSC) will apply. MSC is determined under the rules set by International Air Transport Association (IATA) Resolution 302. To learn more about MSC please see here.